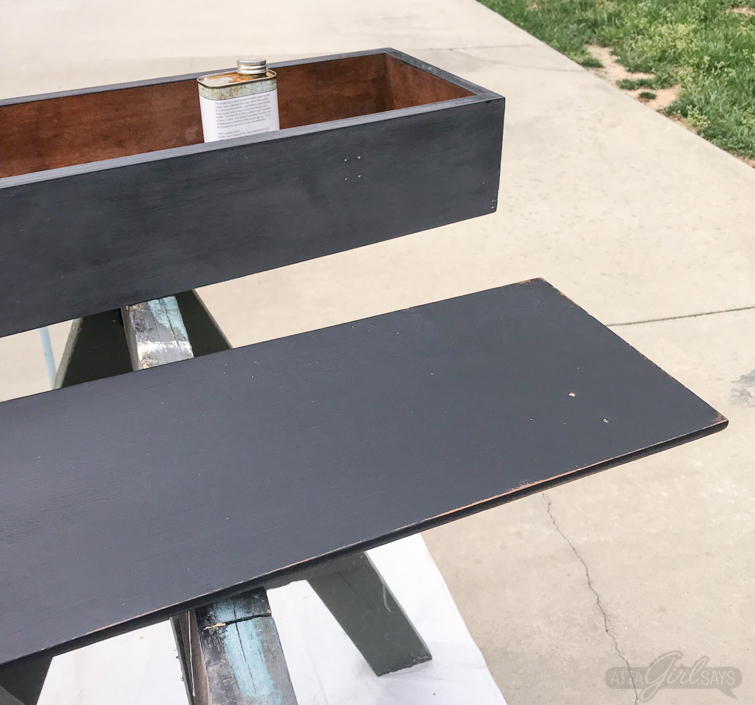 Learn how to transform an old wooden shotgun case, tool box or any vintage wood box into an industrial hairpin leg desk with removable storage. 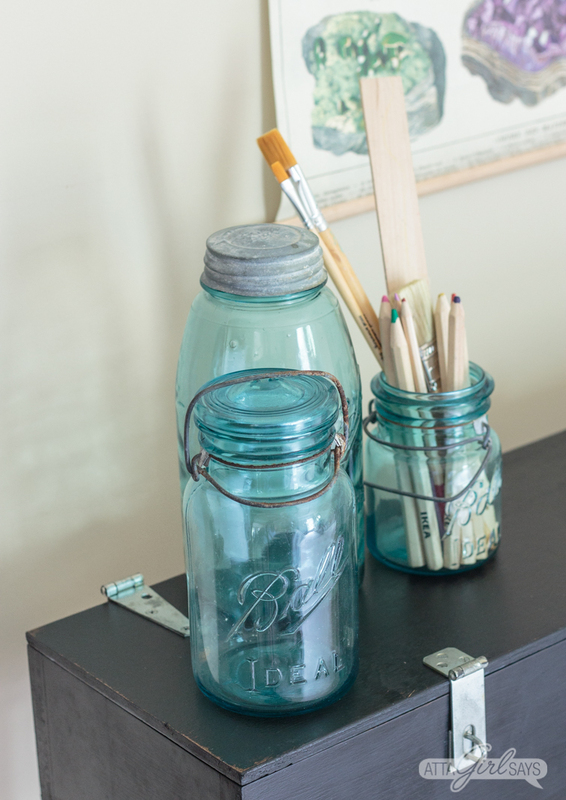 This is an easy DIY project that you can finish in an afternoon. The hardest part is waiting for the paint to dry! We were on our way blueberry picking when I spied the handwritten “Yard Sale” sign in front of the old house. “Pull over!” I shouted before my husband sped past the driveway. I sensed there was some good junk waiting for me. And I wasn’t wrong. This old wooden shotgun case was one of my finds that day. I think I paid about $8 for it, not really knowing how I would use it, but knowing it was too good to pass up. 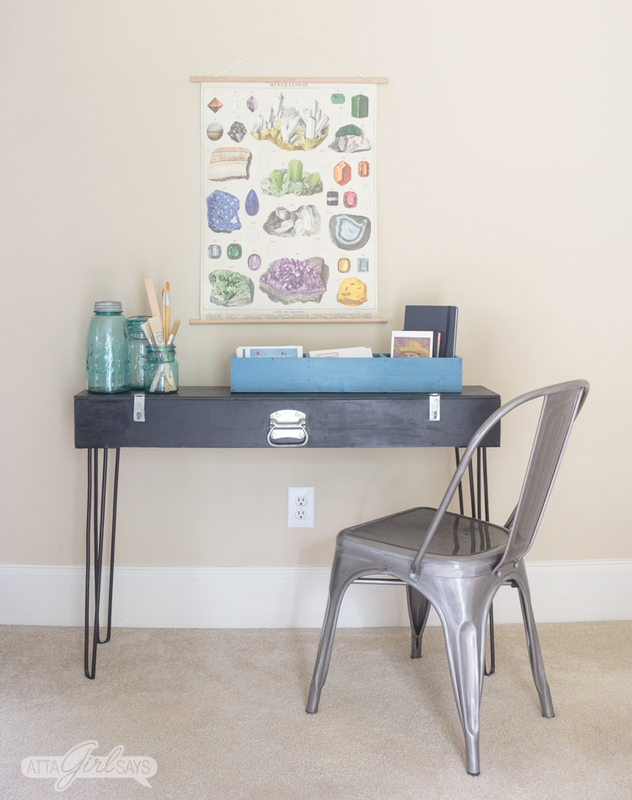 Now it’s been transformed into a DIY hairpin leg desk, with removable storage. 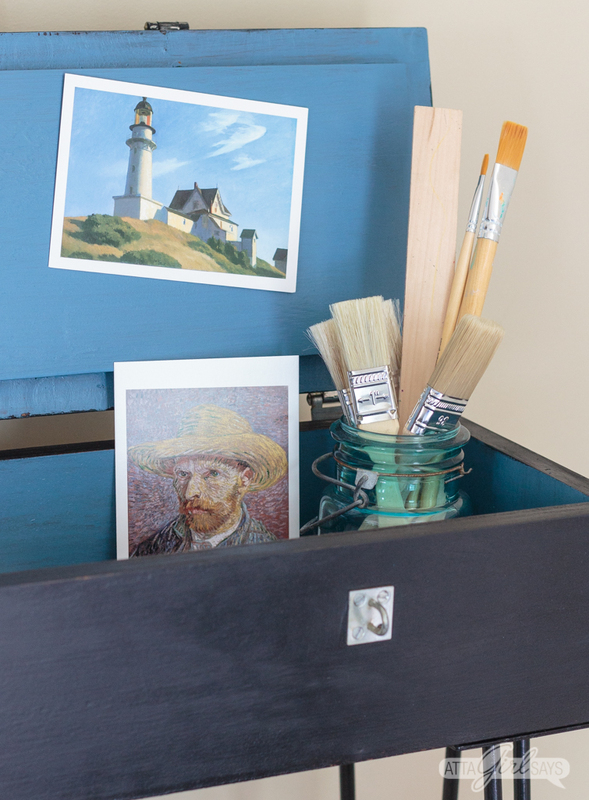 So industrial chic and so useful, especially when you need a workspace in small quarters. This is a sponsored post, and it may contain affiliate links. Read my full disclosure policy here. 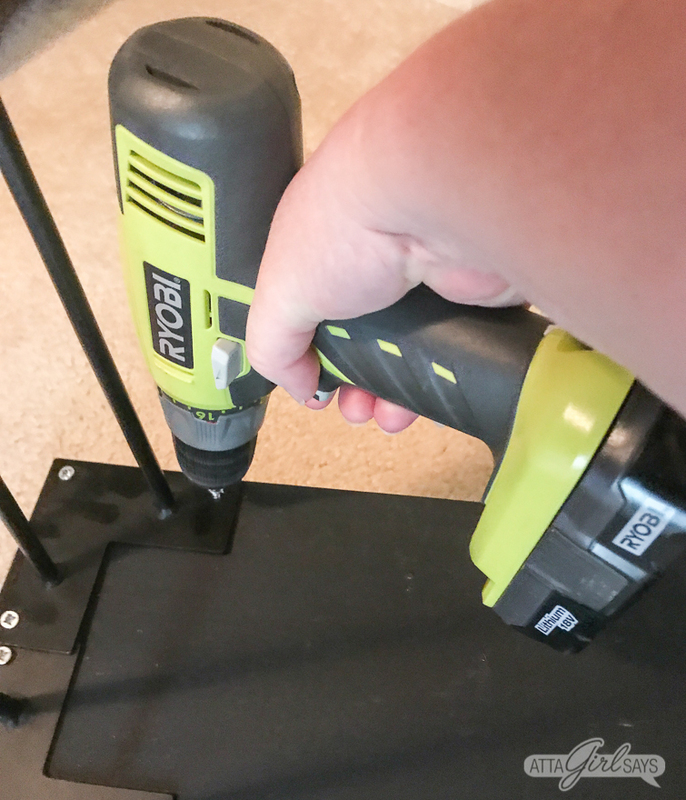 I partnered with Crates & Pallet on this yard sale makeover, joining with four other bloggers to show you how easy it is to makeover your space using trendy hardware. Be sure to follow the links at the end of this post for tutorials on all these projects. For this project, I used an old shotgun case I bought at the yard sale, plus several items from Crates & Pallet. 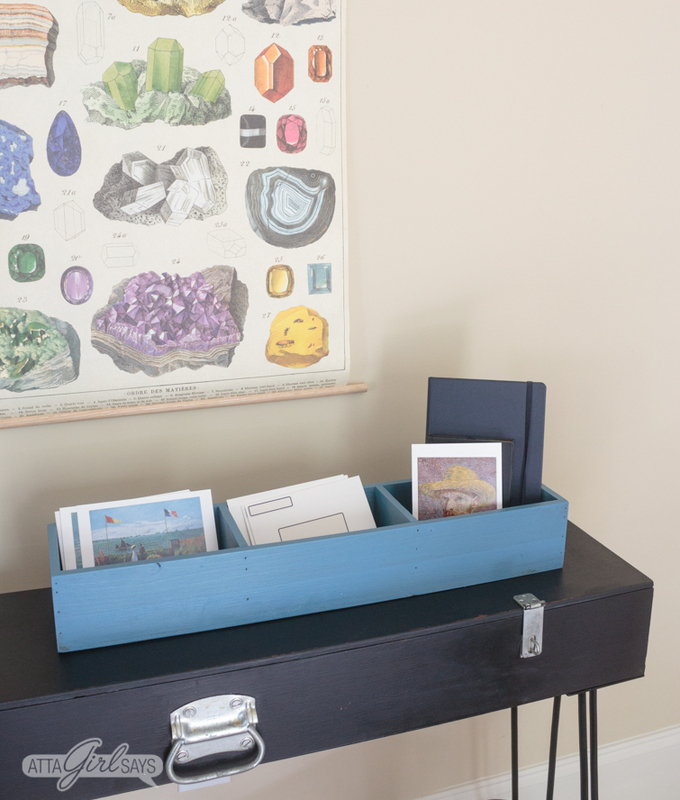 You could also use an old toolbox or any wooden box for this project, or you could build your own. 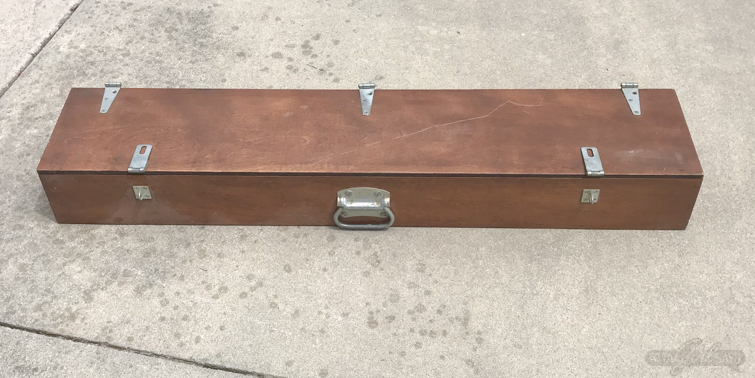 The shotgun case I bought from the yard sale was in good shape, structurally, but the surface had some scratches. So, I decided to paint it. To start, I removed the hardware, which I planned to reuse. I also had to remove the foam cushioning from the box’s interior. Goo Gone helped to remove the adhesive residue. I did have to do a little sanding to the top of the box to get rid of all the foam. I gave the outside of the box a light sanding to ensure the milk paint would adhere. Then I cleaned the box, inside and out with TSP, then wiped it clean with a wet cloth. 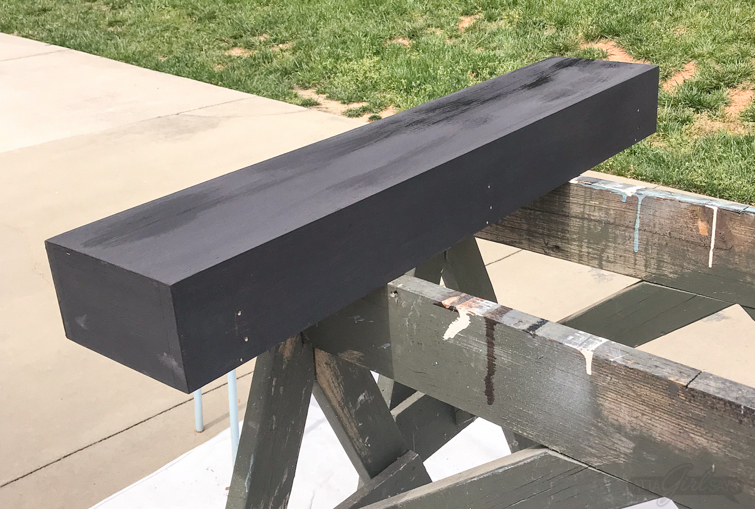 Most of the varnish had worn off of the outside of the box, so I didn’t have to do a lot of prep work to ensure the milk paint would stick without chipping. The interior of the box still had a shiny varnish topcoat. 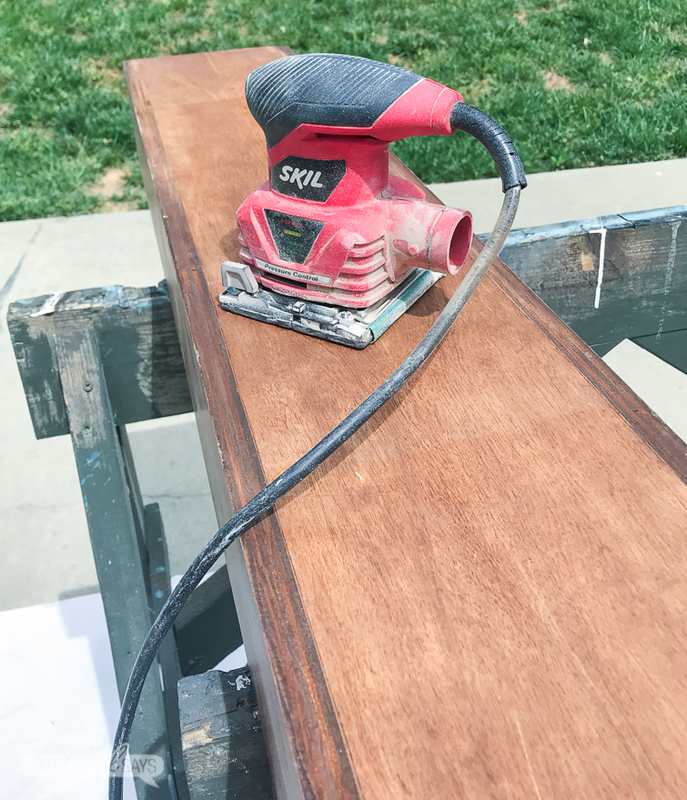 To save myself the time and effort of stripping or sanding it, I mixed some bonding agent with the milk paint to ensure it would stick. I love the contrasting French blue color, which I also used on the Crates & Pallet divided box. 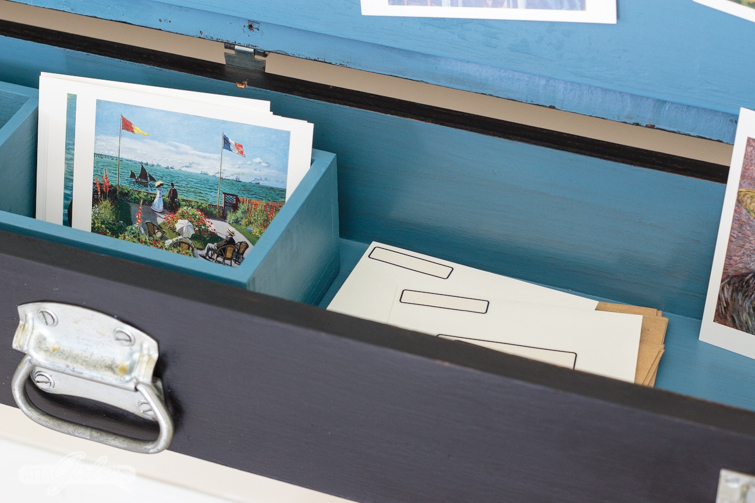 It fits perfectly inside the shotgun case, allowing for organized storage inside the small art desk. But it’s also removable. To seal the paint on the desk and the storage insert, I used hemp oil. Once I’d finished painting, it was time to add the hairpin legs to desk. I used four 24-inch hairpin legs to make this desk-height. 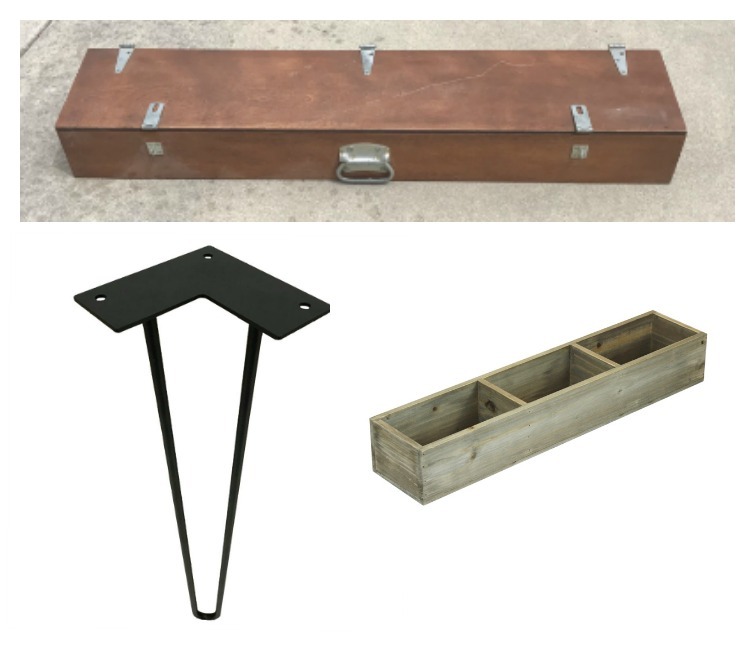 Crates & Pallet also offers 28-inch and 16-inch lengths that you can use for coffee tables and counter-height tables. 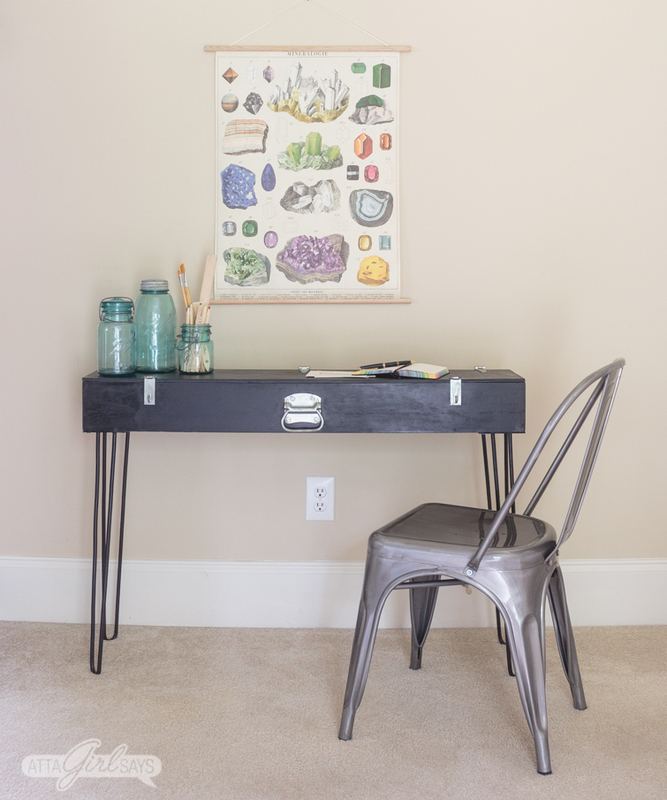 Be sure to measure and consider the height of your desk or tabletop surface before buying the hairpin legs. 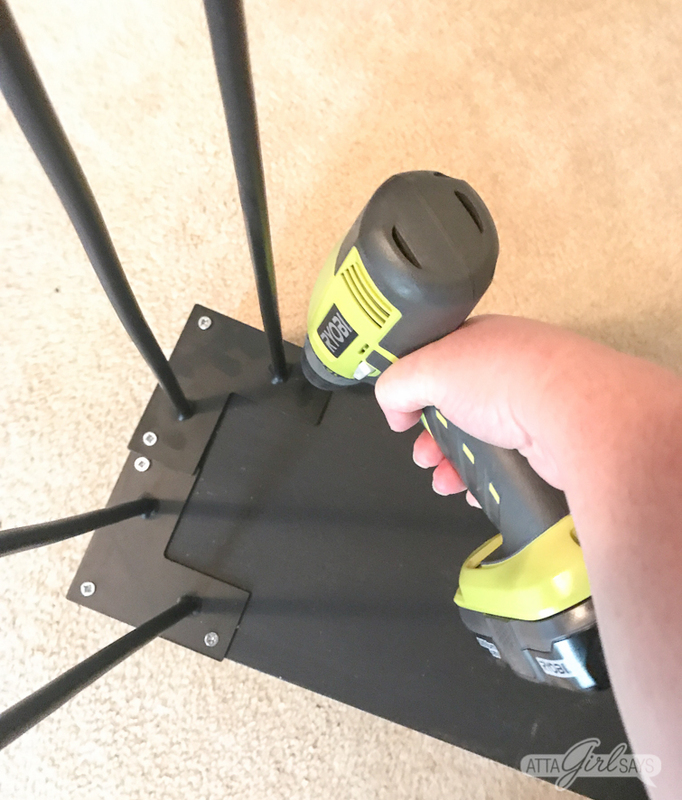 The hairpin legs attach to the underside of your project with wood screws. Make sure you use the correct length screws for the thickness of wood you’re using. Each hairpin leg attaches with three screws. The shotgun box I used is very narrow in depth, so it was a tight fit. I had to overlap the brackets slightly in the middle. But they legs fit, and the desk is level and very sturdy! When I bought this shotgun case at the yard sale, I wasn’t sure how I was going to use it. I’m so glad I was able to turn it into a useful piece of furniture, with minimal effort. It makes a great writing and art desk for my son. I love that pop of blue inside and all the hidden storage! 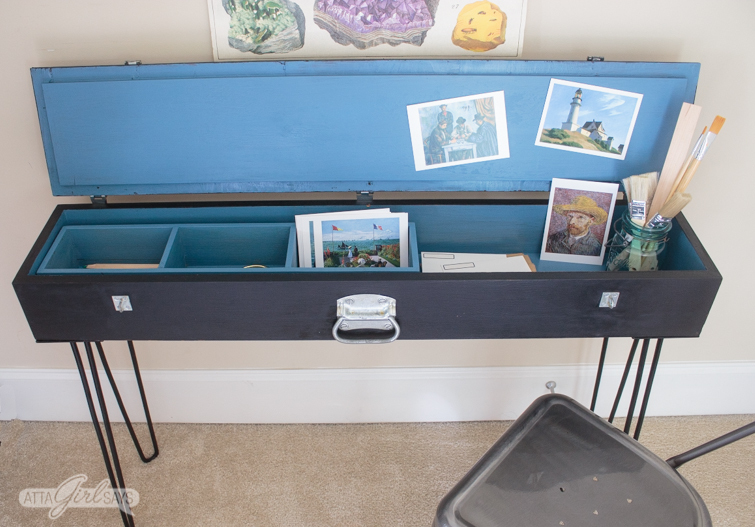 You can stash a lot of art and letter-writing supplies inside this shotgun case turned hairpin leg desk! 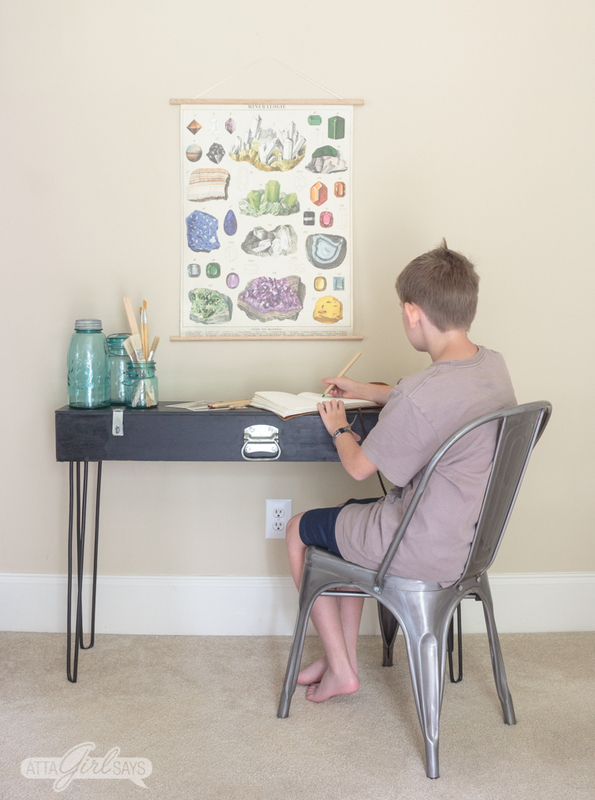 I hope this project has inspired you to build your own desk or furniture using hairpin legs. This is so amazing, what a great upcycle!!! I love this so much! The colors are perfect and I’m a sucker for MMMP! Those hairpin legs just make the whole project! Agreed! Just love how this turned out. And maybe it will keep the kiddo organized. I can dream, right? What an amazing makeover! This is great for a kid’s room or a small space. The blue interior is unexpected, but a great touch. Thanks for the inspiration.